How to make a toy car from old parts! It’s rainy outside… that means no sun to power all the solar toys, stuff, things, chargers, whatever you have on solar power. 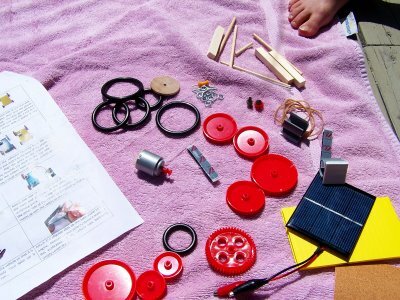 So what a great opportunity to start building a solar powered toy! Do you know how to make a toy car? 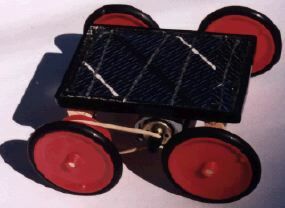 Good to begin with, because a solar powered toy car is well… more easy to make then let’s say a solar powered helicopter. You have to begin somewhere, eh? OK, so what do you need? You can also use an old CD-player for bits and parts and use a DC motor from an old mobile phone (which causes the phone to vibrate). As you can see, the basic is pretty simple! Just replace the battery with the solar panel. I think if you make holes in the sides you don’t even have to glue the straws to the bottom of the bottle. 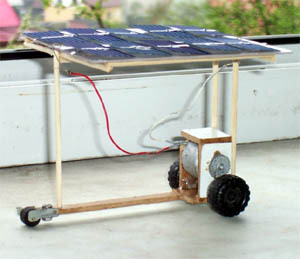 Here are also some cheap solar kits with all parts included, like a boat, etc. Take a look here: educational solar kits. This must definitely be the smallest solar powered toy car I’ve ever seen….. The electric motor is from an old mobile phone! Check out this Czech website (translated) with lots of pictures of homemade toy cars. 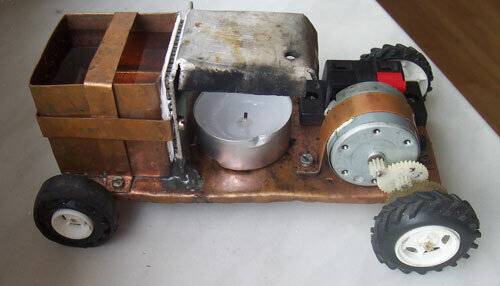 This guy even made a car which runs on juice and vinegar! This toy car runs on cold water (in a small tank on the left) and the heat of a candle. Due to temperature difference it creates a thermoelectric effect (Peltier effect) to run the electric motor. Hungry for more? Take a look at all diy toy cars designs at instructables.com.